A Baker’s Cyst is also referred to as a Popliteal Cyst. A Baker's can be observed as a swelling or a bulge behind the knee. The symptoms are often annoying, because the pain and stiffness can lead you to limit your activities especially when the leg is fully extended. 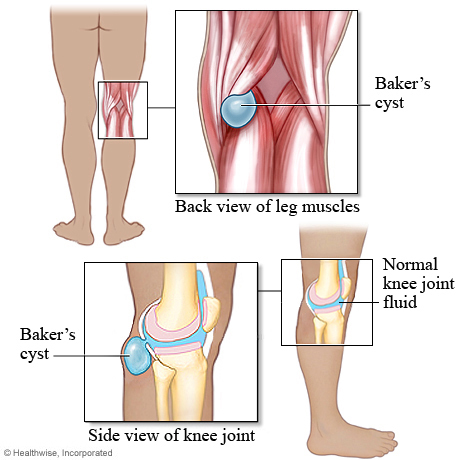 A Baker’s Cyst is most commonly diagnosed in individuals as a result of another condition in the knee that causes inflammation or swelling such as arthritis or a meniscus tear. These conditions produce a lot of synovial fluid. In a healthy knee, this fluid normally circulates through the knee joint allowing it to be lubricated. However, in an arthritic knee or a knee that has a tear, there is an overproduction of fluid and the excess fluid may get trapped in the sac or bursa in the back of the knee joint. As a result, the bursa expands in the back of the knee and becomes a Baker’s Cyst. The swelling can become so severe that the cyst in the back of the knee can burst or rupture. The Class IIIb low-level laser (LLLT) is at the heart of our treatment program. It provides a safe, effective, non-invasive, painless solution for knee pain from a Baker’s Cyst. It addresses the root of the problem causing the Baker’s Cyst. Patients respond exceptionally well to treatments and usually notice significant pain relief after just a few treatments. In addition, other knee specific chiropractic manipulative, stretching/strengthening and physical therapies including nutritional support and/or customized foot orthotics are utilized to help reduce the pain, strengthen the muscles around the knee joint, increase ranges of motion and off-load abnormal foot gait imbalances. Most importantly... these treatments help reduce inflammation/swelling which then helps improve the overall function of the knee(s)... let alone other musculoskeletal conditions of the spine, associated joints and other related weight bearing structures. At Advanced Healthcare, Dr. Pisarek has been treating sports injuries for over 42 years and has been helping people suffering from various reversible (non-surgical) knee conditions during that time. Patients seek his advice and care if they want to avoid knee surgery or if their knee surgery was unsuccessful. He has treated patients suffering from mild to severe arthritis, bursitis, Baker’s cyst, meniscal tears, tendonitis, chondromalacia patella and failed knee surgery amongst other conditions. non-invasive treatment options for your ailing knee.